Ok, bakers. Let’s talk. If you’re like me, you’re starting to get excited, even a little antsy, because summer is so close you can almost taste it, and that means ALL THE FRUIT DESSERTS. Yes, in all caps. For those of us bakers who love nothing so much as fresh fruits, dripping with the sweetness of the sun, summer is go time, all hands on deck, batten down the hatches and start your engines and do not pass go and bake bake bake bake BAKE. Which is why the strawberry is so frustrating, because people like to treat it so very delicately: lightly sweetened and macerated then spooned over an airy sponge cake, or layered with whipped cream in a trifle, or encased in gelatin in an icebox pie. All perfectly tasty preparations, but I want to bake! I want flavors concentrated in a thick filling, well-browned crusts, something that will really give a cold scoop of vanilla ice cream a run for its money. For me, that thing is cobbler. I love cobbler so much that we had it at our wedding instead of cake. And yet, strawberry cobbler is sadly unsung out here in internet land. Strawberry pie? 9 million hits on Google. Strawberry cake, 12 million hits. Strawberry cobbler… only 699,000. 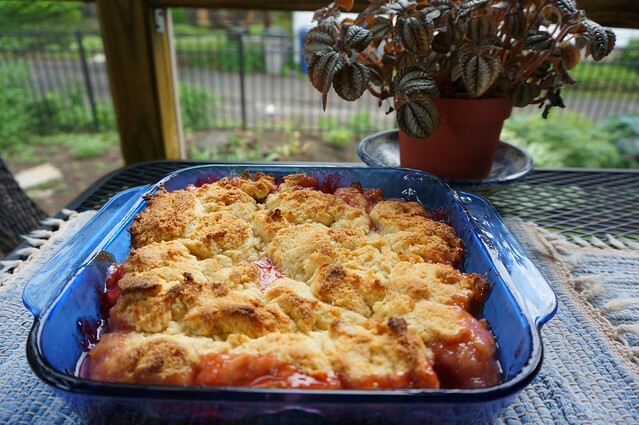 And what a shame: strawberry cobbler is so simple and unfussy you can have it out of the oven an hour after you start, and yet it’s a showstopper. Add some ice cream on the side and it’s practically a meal! (Sorry Mom; perks of adulthood). So grab some of those berries that are showing up for cheap in the groceries, or even better the little intense ones at your local farmer’s market, and bake a cobbler. Plop it on the family table, bring it to a Memorial Day barbecue, surprise your coworkers: it’s a guaranteed win. 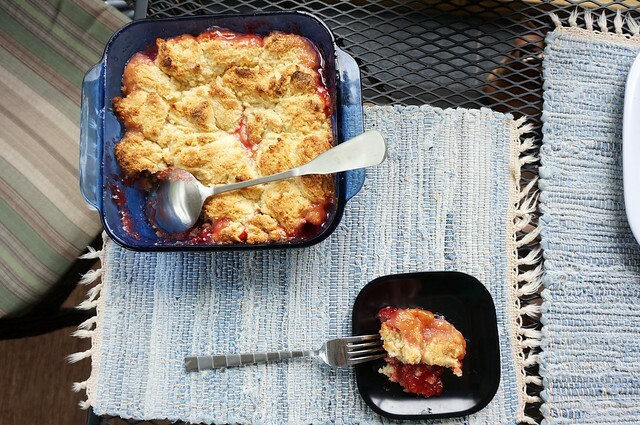 Strawberry cobbler’s one of those old-fashioned desserts that deserves a comeback tour. It’s simple, satisfying, and so easy that you can have it out of the oven an hour after you start. This recipe takes it back to basics with an uncomplicated filling and a sweet drop biscuit crust, with just a touch of coriander to keep it interesting. Preheat oven to 400°F and position a rack in the middle of the oven. Prepare the strawberries: First, hull them; that is, remove the leaves — some people cut a little divot out of the top, but I usually don’t bother unless there’s a woody stem attached; I just rip off the leaves. Then cut the strawberries in half (or in quarters if they’re very large). 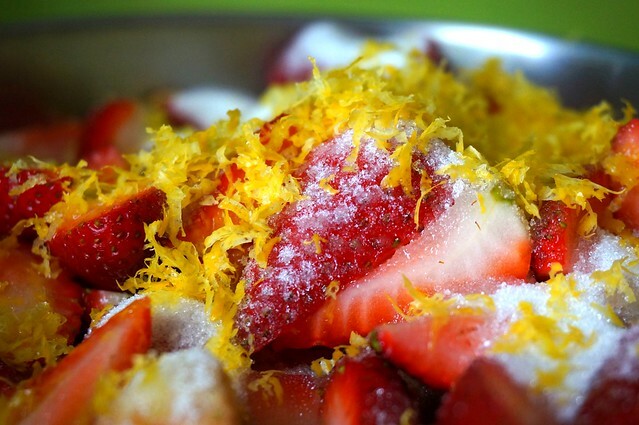 Combine the prepared strawberries with a half cup of sugar, the cornstarch, and the lemon zest, and toss to coat the fruit. Set aside to let the juices come out while you prepare the crust. In a medium bowl, stir together the flour, baking powder, half cup of sugar, salt, and coriander. Add the milk and butter and stir to combine thoroughly. The dough should be very soft, but not liquidy. Give the strawberry mixture another good stir to moisten the remaining dry sugar and cornstarch, then scrape into an 8×8-inch or 9×9-inch baking dish. Dollop spoonfuls of the crust dough on top of the strawberries to cover. This should be enough dough to mostly cover the fruit, but don’t worry if there are gaps; the crust will expand in the oven. Bake in the middle of the oven for 40-45 minutes, until the filling has turned clear and glossy, and has bubbled up over the crust around the edges. (If you have an instant read thermometer, you’re looking for the filling in the middle to be above 180°F.) The crust should be golden brown, with some dark brown on the craggy bits that stick up. Serve anywhere from piping hot on down to room temperature, and if you have some ice cream handy a scoop of vanilla is never unwelcome. First and foremost, you might consider doubling this for a crowd: when I made this most most recently, seven of us polished off the whole pan in about 10 minutes, and most of us were taking fairly polite servings. To double, use a 9×13-inch pan. Cooking time should remain similar, but do poke a spoon gently into the middle of the pan when you think it’s ready to see if the filling has gelled. If it hasn’t, give it another five minutes. 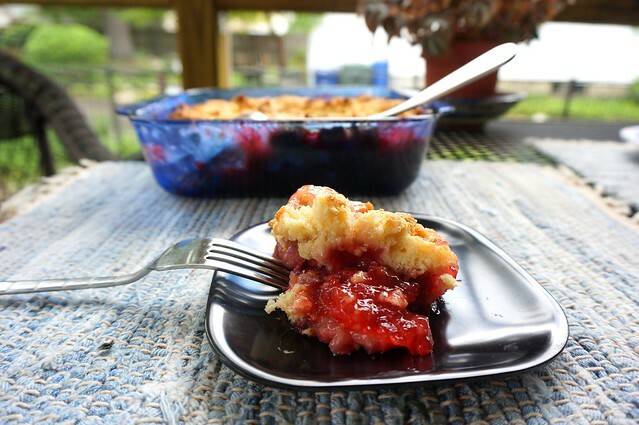 Strawberry-rhubarb is a classic combination, and one that I’ve been eyeing while the rhubarb in my backyard grows. You can substitute half of the strawberries here with sliced rhubarb stalks; you’ll want to bump the filling sugar up to 3/4 c, or even a full cup, depending on how tart you like your strawberry-rhubarb. Try different citrus zests: orange, grapefruit, lime: all fair game. And of course if you want to gild the lily this would be GREAT with mixed berries (black-, blue-, rasp-, dew-, cloud-, lingon-; whatever you’ve got). Mmmmmm, we made this and it’s wonderful! 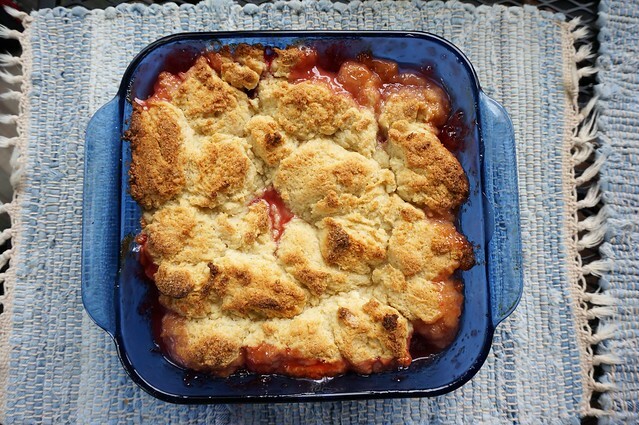 So, I’ve now also used this base recipe to make a peach-rhubarb cobbler, which came out equally strong in the “great summer desserts” category! Peach-rhubarb! I’ve never done that combo before; I like that idea.